BELLEVILLE, Ill. – From reports of an invisible little girl singing softly on the stairs to a feisty spirit who sets small fires because she hates drinking, Belleville has its share of ghost stories. I didn’t think Belleville was a supernatural hotbed of activity until I started to ask around about “haunted places.” Turns out, there are rumors about ghosts on almost every corner. But few people wanted to go on the record about it. I ran into the same problem when I wrote a story last year about UFO sightings in Southern Illinois. After experiencing something they couldn’t explain, many people didn’t want to risk their jobs or reputations in the community by talking about it. “People are always concerned that others are going to think they’re crazy,” Luke Naliborski, a seasoned paranormal investigator, agreed. “Fortunately, this sort of thing has become more mainstream,” he added. He and his ghost-hunting partner, Len Adams, have investigated many local haunts. Naliborski, who owns I Had That! vintage toy, game and record store located in the rear of Collector's Corner at 125 E. Main Street, has published four books about the paranormal and has been leading haunted tours in Alton for 12 years. According to research conducted by Chapman University in October 2017, approximately three of every four people believe in some sort of supernatural phenomena, including the existence of ghosts, which is one of the most common paranormal beliefs. Invisible children and a spirit named Posey. Judy Belleville, curator of the Belleville Labor and Industry Museum, said multiple museum volunteers have experienced unexplained events in the building at 123 N. Church Street. “Once, a retired doctor, one of my best volunteers, was upstairs in the museum by himself,” she recalled and later told her he heard children playing on the stairs, which are original to the house, though there were no children around. After that, “He said, ‘Judy, I’m not coming back,’” she added. In another instance, volunteers were pulling laths – thin flat strips of wood – off the walls and ceiling of the second floor of the museum in an effort to clean the upstairs, when two young men “saw something,” like a woman’s skirt twirling, ran down stairs and left the building. Bob Poole, had been volunteering at the museum for 3½ years when he heard footsteps upstairs when he was there alone one Saturday. “I yelled, ‘Judy, you up there?’ and went upstairs to see,” he said, “but there was no one there.” When he got back downstairs, he heard the footsteps again. Instead of going up again, “I yelled, ‘I don't know who’s up there but you’re welcome to stay,’” he claimed and the mysterious noises ceased. Unlike other witnesses, Poole is not afraid to be alone in the museum, but said during the that particular incident, “The hair stood up on the back of my neck,” he admitted. According to Belleville, another of her longtime volunteers heard a child singing something like a nursery rhyme on the stairs on two separate occasions around two years apart, however, the singing was too soft for the words to be understood. If you would like to explore the “most haunted” location in Belleville, the annual Belleville Museum Open House Day will be held Saturday, June 2, from 10 a.m. to 2 p.m.
Phantom prop-master. Constructed in 1924 as part of the old Belleville West campus, the current site of Lindenwood University-Belleville and its auditorium has played host to a variety of events over the years, from Philharmonic concerts to numerous theater productions and even last year’s Belleville mayoral debate. Some say it is also home to the helpful spirit of a former teacher. According to the websites of the Southern Illinois Ghost Hunting Team and other ghost hunters, a teacher was sick and unable to teach, but loved the theater so much she continue to check on the children during the days before her died. According to the local lore, even after the lady’s death, she appeared in the auditorium to make sure everything was going well. Some say the theater-loving teacher continues to haunt the location and she’s most active just before the opening of a play. Footsteps and shadows. 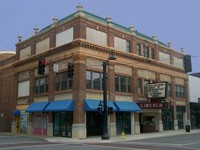 The historic Lincoln Theatre (above) opened October 6, 1921, and for almost a century, has shown countless films and played host to stars such as Ginger Rogers and the Marx Brothers. According to a Belleville News-Democrat article from October 12, 2006, by Jennifer Kapiolani Saxton, it also is the abode of at least four ghosts: a stage hand, a handyman, a doctor and a performer named Aretha. A booze-hating pyromaniac spirit. Prior to housing the Papa Vito’s Restaurant, the building at 318 E. Washington Street had a storied history. At one time, it was a Pasta House; prior to that, the Carriage House Restaurant, and earlier, it was a school. In between, several other business establishments occupied the space. In the October 27, 1991, edition of the News-Democrat, columnist Michelle Meehan interviewed Belleville psychic Terry Engle concerning her experiences at the building – Engle has since died. In 1978, the location was experiencing a series of small fires and it was believed someone was setting them. Engle had a different theory. She investigated the premises after hours with the property owners present and at that time said, “We met an energy I interpreted as female.” She claimed the energy conveyed the idea it was “an old schoolmarm” who “dearly loved” the building. “She said she didn’t like booze and there was something that needed to be repaired,” Engle related. After the repairs were completed, the fires ceased. More Belleville ghost lore. Belleville reference librarian Freda Blanchard and her supervisor, Anna Kimball, insisted the public library on Washington Street is haunted. According to Blanchard, you can “feel the energy drain from your body” as you walk through the main doors up the staircase to the nonfiction and reference area. Kimball shared stories of library patrons “sensing” someone sitting down in a chair next to them, hearing the creaks and settling noises of a body coming to rest when no on is there. I’m open to adjusting the list if I hear some more ghostly happenings going on somewhere else in Belleville. Feel free to send your ghost stories and tips to questions@bnd.com. Suggested reading. Of the four books he’s written and published, Naliborski said he has a soft spot for The Lighter Side of Darkness: Misadventures into the Unknown. If you purchase a copy from the author at his shop, word on the street is he will sign it. His other books include Creepy with a Chance of Ghosts, Ghosts Never Say Boo, and Lights Out! More True Tales of Ghosts from the Lighter Side of Darkness. Source: Heidi Weichert, The Belleville News-Democrat, May 17, 2018.